Korea's Information Society: Olympic diplomacy in Korea: A possible turning point? Olympic diplomacy in Korea: A possible turning point? Although I don't have time at the moment for a more detailed treatment of the subject, the news coming out of talks between North and South Korea is most interesting. It confirms some of my speculation in earlier posts, after PyeongChang was awarded the 2018 Winter Olympics, that North and South Korea might possibly cooperate in hosting the Games. As reported today by the Chosun Ilbo, the two Koreas will hold a celebration at Mt. 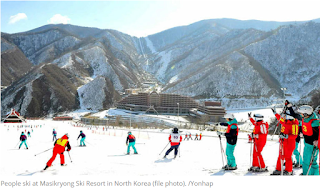 Kumgang (Diamond Mountain and the stuff of proverbs and lore in Korean culture.... "Even Diamond Mountain can wait until after eating") on the eve of the 2018 Winter Olympics. Another part of this evolving story is the announcement that athletes from North and South Korea will train at the new Masikryong Ski Resort (click on the accompanying graphic for a full size version) in the norther half of Gangweon Province, built shortly after Kim Jong Un assumed power in the North. In a separate story, the Chosun Ilbo reported on the shortcomings of ski-lift equipment at the Masikryong Resort, built while North Korea was under international sanctions that prevented import of a more modern ski-lift facility. Can Olympic diplomacy continue and have an impact beyond the 2018 Winter Games themselves? We shall see, but given the profound political impact of the Seoul Olympics three decades ago, the possibility that this may represent a turning point should not be discounted.